Have you ever seen the Northern Lights… from space? The perennial bucket-list experience – seeing the aurora borealis and the aurora australis (Southern Lights) in the night sky – could one day get trumped by the chance to see them from 200 miles up in low-Earth orbit. Named after the polar phenomena, Aurora Station is a concept from US space company Orion Span to create a ‘luxury hotel in space’. Able to host six people, including two crew members, Aurora Station is slated to begin operations in 2022, with guests paying the suitably unearthly sum of $9.5 million for a 12-day trip. Aurora Station will offer a 'true astronaut experience', but is it a viable 'space tourism' product? What is the Aurora Station? Claimed to be the first fully modular space station, the design for Aurora Station has lots of windows, and Wi-Fi so guests can livestream their views of Earth back home. Since it will be orbiting around 200 miles up, guests will orbit the planet every 90 minutes, so 16 times per day, with a sunrise and sunset to watch each and every time. When that gets dull, there’s a VR holodeck. At first, the VR experience will consist of scenarios where guests can ‘feel as though they were walking on the moon or playing golf back home.’ However, Orion Span plans to eventually offer projected holography, a technology that right now is years away from practical implementation. When will the Aurora Station launch? Aurora Station is due to launch in late 2021 and open its doors (okay, airlock) in 2022, and Orion Span is now taking returnable deposits of US$80,000 for trips. The total US$9.5 million price of a 12-day stay includes the outward and return journeys, as well as training, astronaut certification, first-class roundtrip airfare and five-star accommodation at the launch site. Are space hotels the next step for space tourism? Okay, so this may all be a little premature given that the likes of Virgin Galactic and Blue Origin have yet to begin their planned suborbital space tourism flights, but Orion Span is already looking beyond those early space tourism experiences. Is the Aurora Station realistic? The prospect of SpaceX, Boeing and others providing trips into orbit for space tourists seems distant, which makes even getting to the Aurora Station problematic. Bunger insists that guests will travel to and from Aurora Station on a rocket launch by space agencies, or with companies like SpaceX or Blue Origin. However, a major challenge is that an orbital space station requires the use of fully-tested parts that work continuously for very long periods; ground servicing is not possible. What’s wrong with the ISS? Orbiting since 1998 and growing all the time, the International Space Station (ISS) is a space laboratory, not a hotel, although is has played host to several multi-millionaire space tourists. “It has a less-than-desirable environment for discerning travelers, with a utilitarian design, exposed cabling, and a proliferation of Velcro,” says Bunger. There’s also the small matter of training. “The training program [for the ISS] is extremely lengthy at 24 months, and there is no certification program,” says Bunger. Orion Span plans to conduct online training followed by in-person training at Orion Span’s HQ in Houston, Texas. Part of the reason why that's possible is the design of the space station hotel itself. Is it cheaper than a visit to the ISS? Will Aurora Station orbit close to the ISS? Around 200 miles above the Earth and at 48 degrees inclination, Aurora Station will have a different orbital path to the ISS. First up, it would orbit slightly lower than the ISS does, so the views of Earth will be slightly better – at least in terms of guests trying to photograph their hometown and other landmarks. It will also be observable from Earth, just as the ISS is. Is Aurora Station just for space tourists? That’s key, even if Aurora Station itself seems like a pipe-dream; it’s possible the U.S. could walk away from the ISS during the 2020s, which would almost certainly kill it off. So where would astronauts go? Aurora Station could eventually be one destination, but it's one of a few on the drawing board. With the imminent testing of SpaceX’s Crew Dragon and Boeing’s CST-100 Starliner spacecraft – each able to take six or seven astronauts – the price of getting into orbit could fall over the medium term, and that will eventually attract the attention of governments in small or developing countries wanting to send their own astronauts into orbit without needing to start their own hugely costly space program. “Aurora Station can host remote sensing equipment, communications equipment, and it can validate space hardware for commercial and government entities,” says Bunger. Not surprisingly, Orion Span is not the only company eyeing up the need for spaceflight opportunities from state-owned space agencies. Another is Axiom Space’s Axiom Station, which would involve attaching $2.2 billion worth of habitation modules to the ISS that can eventually orbit alone. However, the most advanced project is Bigelow Aerospace, whose inflatable BEAM (Bigelow Expandable Activity Module) module has been attached to the ISS since 2016. 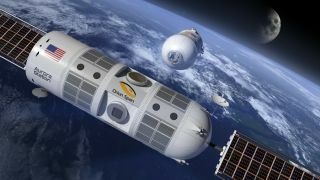 Bigelow Aerospace has plans to create separate, independent space stations using its larger B330 modules, and launch them into orbit in 2021 – and into lunar orbit by 2022. So the primary business case for ‘space hotels’ is likely to be as research destinations for the next generation of astronauts … and perhaps the occasional billionaire.